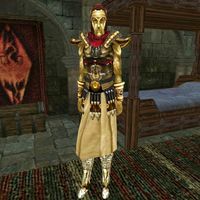 Angoril is an Altmer master-at-arms, serving as Knight Protector of the Imperial Legion in Pelagiad. He is a guard at the jail in the fort, and carries the keys to the cells on him. If you kill him or pickpocket it from him, you can free the prisoners. If you are a member of the Imperial Legion, he does not offer any quests, saying that not much is happening around Pelagiad when you ask him about "duties" and will redirect you to the other Legion forts. He can however provide you with advancement in the Legion, like the other garrison commanders. He also offers minor training in Axe, Blunt Weapon and Long Blade for high-ranking members. He wears a complete set of Imperial Templar armor, except for the helmet, and an Imperial Templar skirt. For defense he carries an Imperial broadsword, and he also carries one of the two existing copies of the key to the prison. Free New-Shoes Bragor: Free a fellow member of the Guild from prison in Pelagiad. This page was last modified on 2 July 2018, at 08:03.